Please can you advise if it would be possible for a chatter profile to contain a setting, possibly a check box, which can be selected when out of the office. An indicator will then show on the persons profile. It could be that a band appears across their profile picture like the moderator ones? Just a thought as it would be easier than needing to change your profile picture to the out of office picture which we are using at the moment. 9/4/2013 Update - Changed title to "Out of Office Status on Chatter"
Quick update from our Product Team: This idea is still under consideration, however we don't foresee being able to work on it in the next year given our current set of priorities. That being said there is a free Chatter OOO solution available on the AppExchange that could address the need in the meantime. 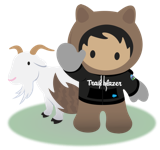 The ability to set an out of office status on your Chatter profile was delivered as part of the Winter '18 release. This feature has been requested years ago, still in consideration years ago, and still asked for recently, so Salesforce, why hasn't it been implemented yet? We're spinning our wheels at our company trying to find a workaround. Rather than changing the name, you can edit Title and Company with the OOTO message, but there should be a better way. Our solution, and my vision for the final product, is to change the name of the user when it is typed, so when you try and tag someone, you can see their name contains "Out of Office". We do this manually by asking users to update their name in My Settings while away. I have even gone as far as to update my Title to state additional information (i.e. Returning Monday). This works great except it can cause problems on reporting snapshots where we capture a user's name and summarize data by name, we end up getting the "temporary" name in the snapshot data. If a user could set something in My Settings that would insert a message when that user is tagged in a post, letting the other user know they are out, that would be a big help! Would see this as a great benefit to our team and open communication. This would be veyr helpful for our org. A native solution for this problem would be very helpful for our business. The profile picture approach is rather unrefined. I have not found a viable appexchange solution. The ones I evaluated auto-reply to posts to individual's profile. We need to give upfront feedback so our users can tailor theire posts with that in mind or go to another person for help. We also need this anywhere a person is mentione on a record and auto-reply jsut clogs up the feed. In the meantime we change our profile pictures to one that shows conveys the out of office status since that shows up anywhere you are mentioning the person and on their profile. We even change our last names on the profile by appending a short blurb about how long we will be out. It is effective but it is a pain to manage and we have to be careful about using the lastname field in reports and views. Is there an app exchange application that will work anywhere a person is mentioned and before the post is made? We have several teams often asking for this functionality. Seems like the solution is nearly there. Today, if someone @ Mentions me, I receive an email notification in Outlook. In Outlook I have the option to manually reply to that email which would post right back to that original @ Mention. So why not work with an automated response (Out of Office)? I've tested it several times and the automated reply does not make it back to salesforce. Fix that and you've got the solution. Users would just have to set their out of office in outlook as they are already accustomed to. Our users frequantly ask for this feature. Any update on this over the past couple years? I would prefer to not install another AppExchange solution for something that should really be handled natively. This would be really beneficial to my users. Hi there, by mistake / experiment I accidentally put on an out of office in chatter and now all my chatter feeds are cluttered with an auto out of office from me. I am back in the ofive now! Can you let me know how to remove it? Hi @Kristie Garafola, considering the Appexchange App doesnt work for @mentions can this be looked at again.